Photo April 30, 2017 by Deborah Lee Soltesz. Credit: U.S. Forest Service Coconino National Forest. So often we think of darkness as a bad thing. Naturally, we prefer to be able to see things clearly. But it is also good to have moments when very little can be clearly seen. This is the time we need for rest and introspection. Philosopher Erazim Kohák wrote about this “gift of the night” in his book The Embers and the Stars: An Inquiry into the Moral Sense of Nature. He says we use our electric lights too much. With them we tend to push away the darkness. One obvious consequence of this is that we are no longer able to see the stars as clearly. This is important to more than just astronomers. The stars are a source of wonder, and according to Plato, philosophy begins in wonder. This is the moment one contemplates the nature of the universe and our place in it. In the daytime we are confronted with the details of the tasks we have to complete. This is the time most of us do our work. But nighttime helps to give space for the mind to wander in a way that it cannot in the daytime. If you think of feelings you have when you are awed by something – for example, knowing that elements in your body trace to exploded stars – I call that a spiritual reaction, speaking of awe and majesty, where words fail you. If we are outside at night long enough our eyes adjust and we begin to notice that the night is not completely dark. Then we can recognize the recurring patterns that reveal the rhythms of nature. Certain constellations and planets appear at different times of the year; the Milky Way changes orientation in the sky; and each month the moon illuminates more or less depending on its phase. By taking time at night to observe these movements the broader universe itself becomes more familiar. And with the lights off animals come nearer and remind us that we share this place with them. This can be exciting if we are unsure what lurks out there. This too is a moment of wonder. Then we notice that we see much more at night without artificial light. Lights blind us to the night’s more subtle appearances. So see more by turning out the lights! 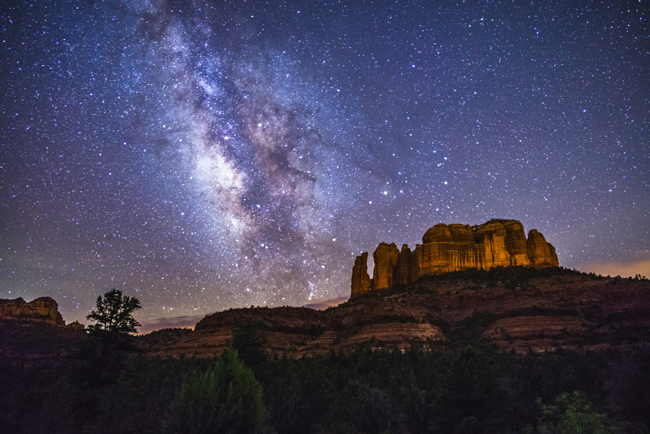 Join us this Sunday, June 8 at 2 PM at Red Rock State Park to discuss these ideas and more at our talk: Why Dark Skies Matter. The talk is free with park admission (Adult 14+ $7.00, Youth 7-13 $4.00, Child 0-6 Free).